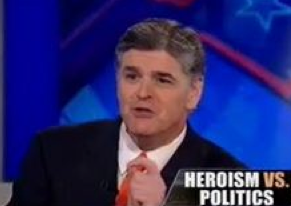 Sean Hannity lead off his show last night with a look at NBC’s “Rock Center” and their hour-long report on the killing of Osama Bin Laden, which included interviews with Pres. Obama, Secy. of State Clinton and other members of the administration. “I would expect this production to be at the DNC convention the night that Obama speaks,” huffed Hannity, calling the NBC News report an “infomercial” for the Obama campaign. Fox News analyst Kimberly Guilfoyle agreed: “Why does he need a campaign or a team?” she asked, “He has the mainstream media. He has NBC throwing this all out for him,” said Guilfoyle, whose ex-husband, former San Francisco mayor Gavin Newsom is getting is own show on Current TV this month. As we reported earlier, Hannity wasn’t the only Fox News host going after NBC last night.